Transferring photos from a computer to the iPad is very easy with the help of iTunes. To get started, you’ll need either a Mac or PC with iTunes, a USB connector cable for the iPad, and a folder containing the pictures you want to transfer over to the iPad. 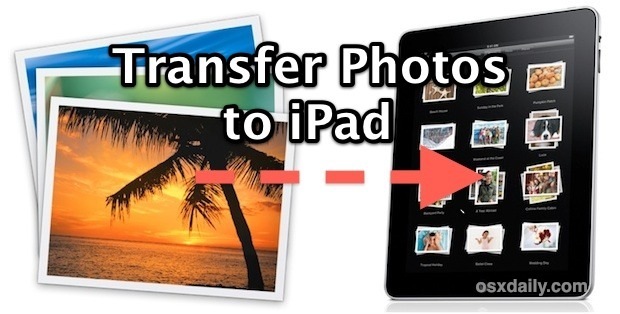 The process is exactly the same in both Mac OS X and Windows, which is why it’s the easiest universal method to transfer photos to an iPad from any computer. The images will sync over and create a new album within the iPad Photos app that contains all the pictures. If the selected folder contains subfolders with pictures, those will transfer as well, but you can uncheck subfolders if you want them excluded. If you need to do the reverse and get pictures off of an iPad or iPhone, transferring photos from iOS to a computer is also simple and can be done entirely outside of iTunes. Finally, setting up iCloud gives access to the Photo Stream feature, which will automate the entire process of syncing pictures between a Mac and an iPad, iPhone, or iPod touch. If you haven’t signed up for the free iCloud service yet, you should do so. Why not use Photo Stream? Commit to iCloud as your storage method and there is no syncing involved everything just shows up where it should. Also for iPhoto users, you can wirelessly “beam” photos back and forth between hardware but you will obviously have to buy the $5 app for iOS. I like the idea of Photo Stream but it needs better file management, plus it’s so easy to accidentally delete everything. Do yourself a favor and backup outside of Photo Stream or you may find yourself losing all of your pictures! Not one step in the outlined process works. Thanks for the frustrating instructions. This is probably a joke to someone. I have nothing called “sync photos from”. God, I hate itunes so much! Whenever I want to do the simplest thing, it is impossible. Amen!!!!!! Leave it to Apple to fix what isn’t broke. I agree with Russ. Directions are stupid. Just curious–Did this work for anyone? Yes of course this works, this is how all of us move photos to an iPad from your computer. Why don’t you follow the instructions instead of complaining about not following the directions? Doug, Instead of insisting this works and telling us to follow instructions, maybe you should believe someone when they say it doesn’t work. I am another one that has no “Photos” tab, so yes this instruction set is useless to me also. I do not see the “Photos tab”? I see options for music and books etc but no photos? What am I doing wrong? None of these instructions work, don’t waste your time. These instructions work to transfer pictures to your iPad from iTunes, why can’t you follow instructions Jim? Works just fine, just did it. Do it all the time. As a photographer, I want to use iPad as a place to display my portfolio. I see nothing about the sizing requirements for the iPad and I must know what size is needed before transferring them. When I opened iTunes there was nothing anywhere related to the photos in my PC. I was told that this was doable before purchasing an iPad, but have been unable to find any detailed information on how to do that. You can store photos of just about any size on the iPad, though the screen resolution on retina is about 2048×2048. Uncompressed PNG or very high res JPG with minimal compression look good, but you’ll be able to view TIFF etc on the iPad. How many photos you can store there depends on the size of the iPad storage itself, 16GB model obviously has less space than 128GB, etc. Copy a few over, you’ll see how it works. No photo tab in my i-tunes either. Is this to force me to use the cloud (and rapidly exceed my free allocation to reach the subscription level)? This instructions does NOT work! Thanks a lot for irritating me to bits ! Yeah, I have an ipad Air 1 and an iphone 5. i-tunes is the only thing I really hate about the i-devices. It never tells u if your doing it right, no feedback at all. I have had some success copying videos over from my go pro but I think I was just lucky. I know i will have to bite the bullet and go and make a genius bar appointment to get some REAL tuition. After wasting time using i-tunes I end up emailing myself and saving the photos to the photo stream. What every one has missed, is you must click on the Ipad in the left column of Itunes. Then a new window opens up and the photos tab appears on the top right hand side. Then the rest follows very well. However it should be noted, doing it this way will remove any photos put on by any other means from any other computer. It does tell you it will remove other photos. Be very careful, once their gone its over. This does work. I’ve transferred loads today. What John said is correct. In fact the photos tab is a small rectangle and it tok me a little while to find it, but it works really well. I kept previously transferred folders checked in iTunes on the computer then they didn’t get deleted. There is NO “photos tab” on the top right hand side of anything! No, everyone has NOT “missed” this. IT ISN’T THERE! If you already have photos and albums on the iPad, “synch” wants to delete them in favor of the ones your bringing from iTunes. What’s wrong with simple file transfers, like every computer (including Mac) and every other mobile device (except iOS) uses? Apple should fix this, but they won’t. The instruction works but as Richard mentioned I can’t do transfer. Every album I sync, it deletes the previously synced album on my ipad !! It’s the case of apple wants to be different !!! I have this problem also. Can you please tell me how you solved it? The transfer as explained works perfectly. Just transferred my first pictures. Ref photo tab in Itunes look at the ipad picture next to music. Thanks very much for the help. When I select Photos, I also don’t get a drop down menu for “Sync Photos From” or “Select Folder” so I can’t get photos from a selected folder from my PC to my ipad? Is everybody above successful or just some of us for whatever reason. I’ve resorted to Dropbox to do the transfer, although it is very slow. But at least it works. Thanks for the tips. However, for you to see the “Select Folder” tab and be able to add photos, you need to make sure that iCloud Photo is disabled in your iPad settings. holy mother…. your comment can save lives!! I’m extremely glad that I scrolled this far down the comment section of this article. Like, one guy recognized the problem, FINALLY. This works fine except for one major problem: when the folder copies to the iPad Pro it simultaneously deletes the previously synced folder. I recommend the FonePaw iOS Transfer which is popular now. You can just use it to transfer almost all kinds of files on your iPhone to computer. If you can’t see “Photos” folder you need to Click on the device icon in iTunes, a small pic of device, should be near the top next to “Music” and under the Help tab. Once you click on the device icon at the top you should see Photos on the left of iTunes under Settings or Summary. Apple makes it so difficult. This syncing business makes it a useless and confusing. You can’t manually put the photos on the device you have to sync, when you sync it asks you…or tells you all your previously sync photos will be deleted. Well, that’s confusing and terrifying. Why would I want to do that? Turn off all iCloud settings on your iPad. Sync with pc saying iCloud is on and it will turn it off. Then you can find the sync photos option. Is this happening only for me ..? I am new to Apple and I have the same problem. I can transfer a picture file, (Picture File #1) and it shows up in Albums all pictures in the file. When I transfer the next file, (Picture File # 2), Picture file #1 dissapears. What needs to be done to correct this? I used to be able to do the transfers as described above with no but with the recent IOS updates, it does not do it and just messes up my photo folders. I only see the folders in the ALBUM tab with no new photos transfered. I got to the part where I launch iTunes, I launched iTunes on my pc now I am looking for a photos tab? Or am I supposed to launch iTunes on the Ipad? BTW I am in the library tab at the top of iTunes as all the other tabs just take me to internet advertising. I’ve got a screen shot but it won’t copy to this page. Any ideas? Absolutely right, Rick! I thought Windows PC’s were not user-friendly until I got my iPad – this is utterly ridiculous! I only want to copy some photos from my PC to my iPad and have been wasting time trying, without success. Whoever said Apple products are intuitive has never tried one! I’m sorry, but this is horrible. This should be simple. Connect the ipad to a Mac or Windows. See the ipad or iphone icon on the desktop. Double click it and open photos. Take any photo you want from the computer or folder with photos and drag them into the devices photo storage app. That’s it. This is way too many steps and not simple and this is the worst implementation of transferring files from a computer to a mobile device that’s out there. Using iTunes it takes a long time to tranfer pictures. My last sync onto my wife’s iPad 2 took 36 hours to transfer 12k of pictures. My iPad is now syncing..12 hours to go! Probably get a normal PC based pad next time. At least it doesn’t go through iTunes then and I can control what I want where!! Doesn’t work for me either. What version of ios are you writing for ? A “photo” tab does not exist on my iPad.